Here you get tourist information for the most important topics compact at one sheet as PDF file. With that you are able to print the city-walks online information simply on one sheet which you can take along at your city trip to Vienna. 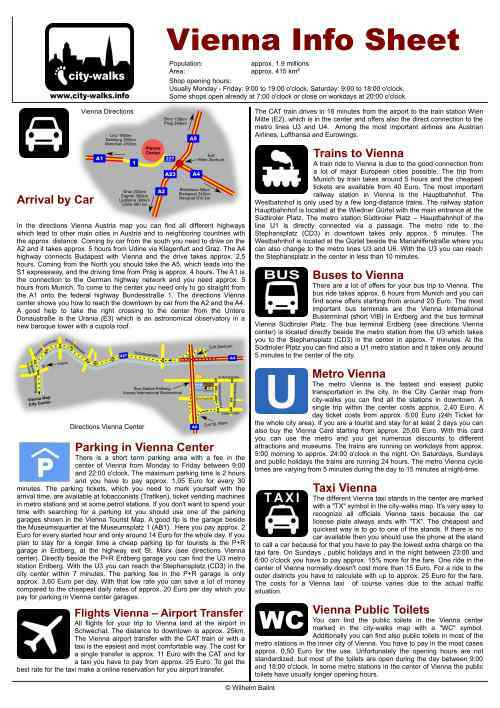 The clearly arranged Vienna directions are also included as well as some tips for parking during your stay in the city center. If you want to do your city trip by train, bus or plane you will also find some useful tourist information at this sheet. And for your stay you get some info for using the metro and taxis in Vienna. Additionally there is information about the public toilets in the center and that may be very useful during a long city walk. Please click on the picture of the Vienna Info Sheet to open the PDF file!